All About Our Lives (Mackenzie and Tanner's Lives): Is Anyone Else Excited? 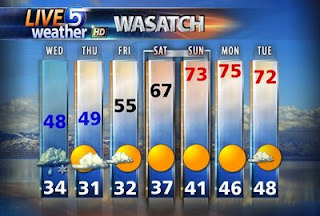 This is supossedly the weather for the next little bit out here in UTAH!!! Is any one else excited to actually see some warm weather coming our way. It has been SOOOOOOOOOOOOOOO COLD!!!! But now things are looking up. I can maybe even start to think about putting my heavy winter coats in a box. YEAH FOR WARM WEATHER! By the way...the most exciting thing is that next week is my spring break, so I may have warm weather for a wonderful spring break. The only sad thing is I will probably be inside packing boxes so we can get out of our apartment. KATIE...just rememeber when we come to live with you...we will just be ONE BIG HAPPY FAMILY! With the emphasis on BIG,lol. I excited to actually have Spring weather for Spring Break too! Now why are you moving in with Katie? Adam is going to NC the beginning of NC, and I have to work here for another month after that. So I am moving in with them. But we need to be out of our apartment by like April 22 or so. My whole family will be staying there also for Chad's Graduation. you are a jerk! I am so excited to have weather were I can stand to be outside for more than 5 minutes. You just need to come live here again! you should come join us! My flowers might bloom before we leave! Cross your fingers. "Hey, if you're bored tonight, call me and we should do something. My brother and I usually play video games or watch a movie or something." is that good enough for date #2?? i'm kinda running low on time i know. I'm so sorry that you had snow today. I ALMOST felt guilty while I enjoyed our 80 degree weather this afternoon. It was beautiful here. Maybe, just maybe Spring is really coming to Utah soon. I will keep my fingers crossed for all of you. I hope it's nice when I get there. Only 11 more days. 15 weeks and DYING TO KNOW!